In 1991, Robyn Brown-Samra took the first step toward embracing her dream. She opened a pickle booth at a flea market. In her words, '...as a Jewish kid from Jersey, I was pretty much raised on pickles and bagels. I felt confident pickles would be a runaway seller.' She was right. With the help of her brother, Jay Brown, and husband, Leo Samra, Pickle Licious opened retail doors at 580 Amsterdam Avenue in New York, where she featured different gourmet products to enhance the variety of pickles. It was a big success, but with her brother moving to start a family and the unexpected passing of her husband, the store closed. 'Inspired by Leo's love of the business, I decided to carry on the Pickle Licious name." 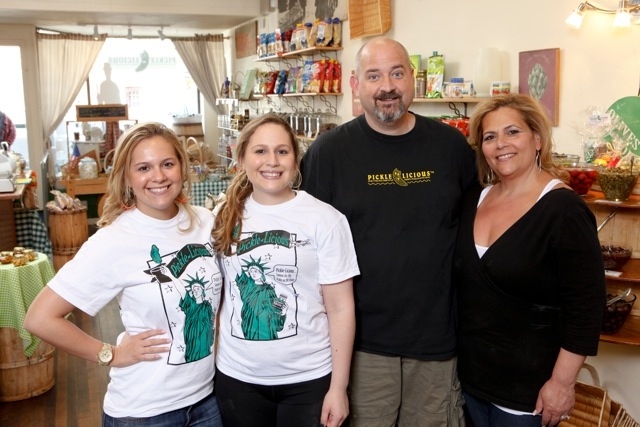 Today Pickle Licious continues as a mom & pop shop that Robyn manages with her husband, Ray, and her two daughters, Alex and Taylor. At Down to Earth Markets, their stand always draws a crowd, often with people asking for their famous pickle-on-a-stick – a treat loved by customers of all ages! Among their many awards, Pickle Licious won the Readers' Choice prize for "Best Pickles, Olives, and Hummus," in a 2013 contest held by Bergen Health & Life Magazine.